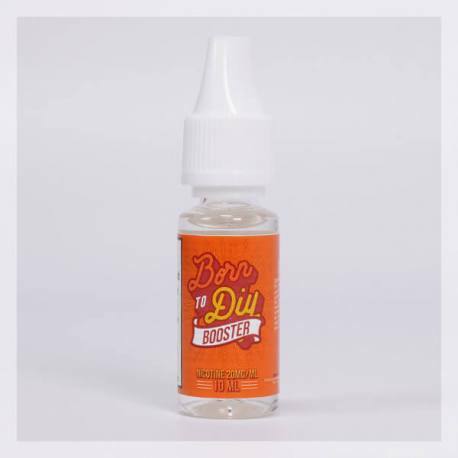 With the Booster Born To DIY, benefit with a base of 10ml with a dosage of 20mg/ml of nicotine for your DIY mixtures. The Booster Born To DIY is to be diluted in a neutral base without nicotine. The Booster Born To DIY meets standard forced base, pharmaceutical quality with a composition of 50% Propylene Glycol (PG) and 50% Vegetable Glycerine (VG) for a good balance between vaping and flavour. With a Nicotine Base the Booster Born To DIY for your DIY ! The Nicotine Booster is a nicotine base conditioned in a 10ml format, in regulation with the DPT from 21st May 2016, banning nicotine products superior of 10ml. The nicotine booster contains 20mg/ml, the highest rate of nicotine authorised by law. The Nicotine Booster must be diluted in a neutral base without nicotine. With the composition of 50% in Propylene Glycol and 50% Vegetable Glycerine, the Nicotine Booster offers a good balance between flavour and vapor. The Propylene Glycol contained in the Nicotine Booster favourises the fluidity and the expression of the aroma aswell as the hit. The Vegetable Glycerine allows the production of vape. Nicotine Booster of 10ml with a rate of 20mg/ml or 200mg in Nicotine. To fabricate your liquid using the Nicotine Boosters, you will need to know the total volume you wish to obtain for the final produce. To create your e-liquid (DIY) efficiently, you will need the following material: Bottles/Vials, Syringes or Beakers, Protection Gloves and Stickers. In the vial, pour in the Nicotine Booster corresponding to the final desired volume. Add in the base volume (without nicotine) into the vial. To finish, close the vial and shake vigorously your preparation. Once the mixture is effectuated, let the mixture stand for a few days so that all the ingredients are well formulated. The duration of the maturation depends on the aroma used to fabricate your liquid. It is important to store your liquid in a dry place away from light. Caution: Nicotine content in the Nicotine Booster is a product which must be handled with care. Always wear protection gloves and protection glasses when handling the Nicotine Booster. If you are somewhat dependent on nicotine, we suggest you use e-liquids with a nicotine dosage of 9mg/ml and 12 mg/ml. If you are just slightly addicted to nicotine, we suggest you use e-liquids with a nicotine dosage between 3 mg/ml and 6 mg/ml. If you are not dependent on nicotine, we suggest you use the 500ml Base nicotine free e-liquid. The absence of nicotine will reduce the hit so prefer stronger flavours such as glacial mint or the mint tobacco mixtures. The Nicotine Boosters Born To DIY are conditioned in a 10ml PET with a dropper for preparing your liquids. Child Safety Cap included. The Nicotine Boosters are made in France by Le Petit Vapoteur. S’il y a mieux dites-le moi!